David Cameron is spending the weekend finalising his first all-Conservative cabinet after his party won a majority in Thursday's election. The PM has already reappointed Chancellor George Osborne, who has also been made first secretary of state. Theresa May, Philip Hammond and Michael Fallon retain their jobs at the Home Office, Foreign Office and defence with other announcements due on Monday. Meanwhile Labour and the Lib Dems are beginning the search for new leaders. Ed Miliband and Nick Clegg resigned on Friday, as did UKIP leader Nigel Farage, after election disappointments, leaving their parties to consider who is best placed to lead opposition to the new government. Tim Farron and Norman Lamb are among the frontrunners to succeed Nick Clegg after he said he would quit as Lib Dem leader. Mr Cameron, who has promised to lead a government for "one nation" after his party won its first majority since 1992 with 331 seats, has already spoken to SNP leader Nicola Sturgeon, whose party won 56 of the 59 seats in Scotland. The SNP is expected to press for more devolved powers for the Scottish Parliament, going beyond what was proposed by the Smith Commission after last year's independence referendum. Speaking on Friday, Mr Cameron said he would "stay true to my word and implement as fast as I can the devolution that all parties agreed for Wales, Scotland and Northern Ireland". Media captionDavid Cameron: ''Together we can make Great Britain greater still"
The prime minister will spend the next 48 hours piecing together the new government. There are more jobs available to Conservative MPs now that the party is governing alone rather than in coalition with the Lib Dems. As he decides who will sit round his top table, the prime minster will need to replace Lib Dems who held cabinet posts in the coalition government - such as former Business Secretary Vince Cable, Energy Secretary Ed Davey and Chief Secretary to the Treasury Danny Alexander, who all lost their seats in Thursday's vote. He will also consider whether to find a role for Boris Johnson, who was elected to Parliament on Friday after a seven-year absence from the Commons. Mr Johnson has a year left to serve as mayor of London. As well as being reappointed Chancellor, George Osborne will act as Mr Cameron's de facto deputy in the added role of first secretary of state. The honorific post, denoting seniority within the Cabinet, was held by William Hague during the last government. The Conservatives have said they will seek to deliver all of their election manifesto in government, focusing on tax cuts, extending access to childcare, extending home ownership and giving the public a say on the UK's future membership of the EU. Leading Eurosceptic backbencher Mark Pritchard told the BBC there would be no pressure for the prime minister to rush into discussions about an in-out referendum on the UK's future in Europe, which he has pledged to hold in 2017. 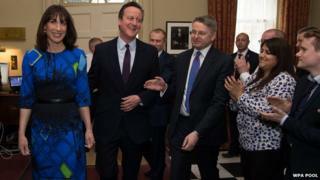 Mr Pritchard said the prime minister would need time to try to negotiate new terms for the UK's membership. "The party will be 100% behind the PM as he goes off to Brussels to fight for Britain, and indeed fight for an improved European Union," he said. Media captionNigel Farage: "Part of me is happier than I have felt for many, many years"
Harriet Harman has taken over as acting Labour leader - as she did in 2010 after Gordon Brown's resignation - ahead of a leadership contest likely to take place later this summer. Although no contenders have yet put their names forward, shadow home secretary Yvette Cooper, shadow health secretary Andy Burnham and shadow business secretary Chuka Umunna are all seen as frontrunners. Some MPs are also urging shadow justice minister and former soldier Dan Jarvis to run. Labour won 26 fewer seats than in 2010 and was trounced in Scotland, where it was reduced to just one seat. Mr Miliband said Labour needed an "open and honest debate about the way forward without constraints". The Lib Dems are also having to regroup after the worst result in their history, which saw them drop from 57 to eight seats. After Nick Clegg signalled his departure as leader, attention has focused on former party president Tim Farron, the most high-profile Liberal Democrat left in Parliament who did not serve in the coalition government. However, former health minister Norman Lamb and former Scottish secretary Alistair Carmichael are also seen as possible contenders. The Conservatives have also made gains in council elections in England, taking control of an extra 26 councils, while Labour and the Liberal Democrats have lost control of four each. More results are expected later in the day. Election 2015 results: What next? Election results: Leader-by-leader - how have they done?